PC release moved up to match consoles. 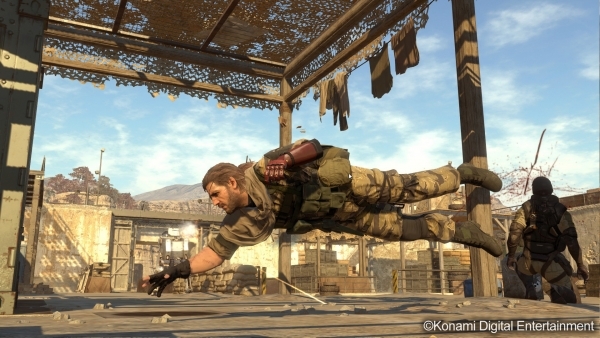 Metal Gear Online, the online mode included with Metal Gear Solid V: The Phantom Pain, will not launch day and date with The Phantom Pain, Konami announced. Rather, it will launch for consoles on October 6 and for PC in January 2016. Additionally, the company announced it has brought up the previously planned September 15 release date for the PC version to September 1 to launch alongside the PlayStation 4, Xbox One, PlayStation 3, and Xbox 360 versions. All Steam customers will receive a collector’s video which reveals behind the scenes footage and a unique documentary, in addition to downloadable content in the form of a ‘Venom Snake’ emblem and Mother Base Staff. With the epic fifth installment of the stealth-action series released on Sept. 1, the new video will show all-new footage related to the Mother Base aspect of the game. The specially-created video will detail building options and unique customization elements. The video will also explain the game’s multi-player FOB (Forward Operating Base) feature, wherein users can establish additional bases around the globe to manage captured resources – and demonstrate for the first time – how users can infiltrate other players’ FOB bases to steal resources as well. Similarly, the new trailer will whet appetites ahead of launch, with a larger overview of the full game and its many gameplay advances and character.